Watering can planter with drainage hole, 1 Low-Growing type Dahlia bulb (Migmom or Topmix), shovel, potting soil. Tissue paper 6 single sheets 8” x18” (20x45 cms), string - 5” (13 cms) length, scotch tape, lollipop stick 8” (20 cms) long. Fill planter 2/3 full of soil. Place dahlia bulb in soil, eyes and old stem facing up. Add more soil so that the crown of the bulb is just below or at soil level. Water sparingly (make sure drainage hole is open). 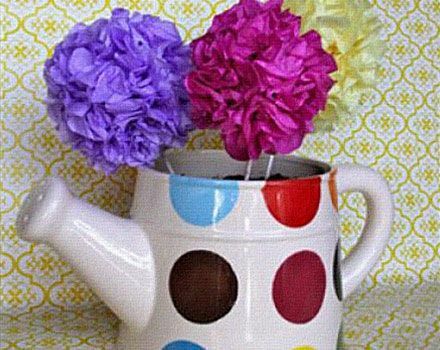 When ready to grow, place in a sunny location, remove tissue paper flowers and water. Continue to water throughout growing season. Layer 6 sheets of tissue paper on top of each other. Cut to the size of 8"x 18" (20x45 cms); this is 1/3 of a standard tissue paper sheet. Make a fold at one end of tissue paper 1 1/2" tall. Flip paper over and fold again. Continue to "accordion" fold this way for the entire length. Tie a string at the center point of folded paper. Cut each end to create the leaf shape. 1" (2.5 cms) on each side. Open one side of flower and pull up each layer of tissue carefully until both sides are completed. Tie the string around the stick and tape stick to flower for extra security.